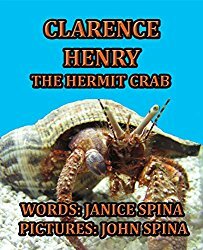 »Authors»Limerick – Jemsbooks – Clarence Henry the Hermit Crab! Here is a Limerick for one of my newest books #10 (2018), Clarence Henry the Hermit Crab, about a pet we had in one of our fish tanks (saltwater). I have had lots of fun writing limericks for my previous books. I just had to do one for Clarence Henry. I don’t want him to feel left out. If you are just stopping by and would like to read the limericks for my other books go to Louey, Ricky, Lamby, Jerry, Jesse, Broose, Sebastian, Colby, Jeffrey. There are 11 children’s books presently, a new one (a fairy tale) will be coming this summer.